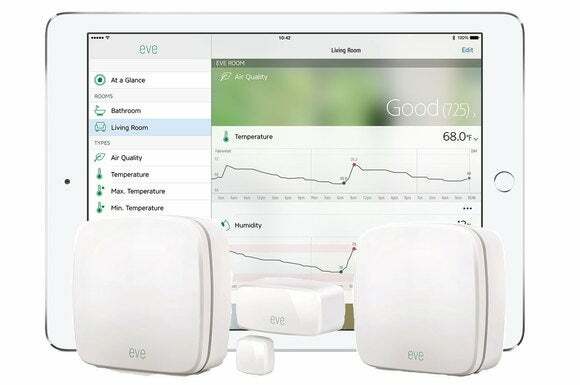 Elgato's HomeKit devices couldn't be designed more elegantly; and except for the Eve Energy, they're reasonably priced. If Elgato’s HomeKit kit products aren’t an homage to the movie Wall-E, I’ll eat my hat. It would be a baseball hat, and my least favorite, but I don’t think I have to worry. Look at the image above. Even if the company claims otherwise. 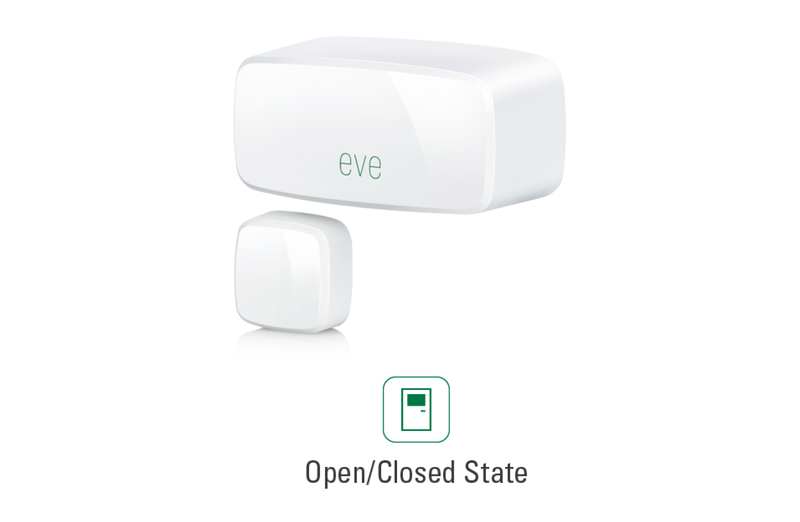 If you don’t know what the heck I’m talking about, Elgato’s environmental and door/window sensors and its remote on/off switch are styled much like EVE, the robotic love interest in the animated Pixar movie; they’re clean and gloss white with just a hint of green. Okay, there’s blue in the movie as well and the green flashes, but…. Then of course there’s the name. It’s all-caps in the movie, but those are about the only things that aren’t note-for-note. I’m dishing out compliments here. They look nice. And unobtrusive in my largely white-walled rooms and hallways. 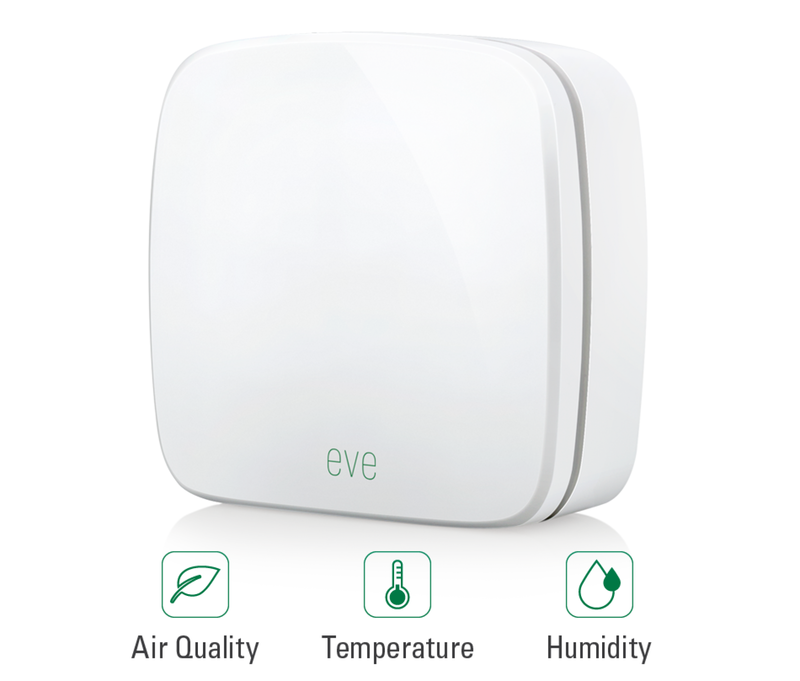 Elgato’s Eve Weather is an outdoor barometer, thermometer, and hygrometer (humidity) sensor. Elgato sent me all four devices pictured at the top: The $50 Eve Energy, a smart power receptacle; The $40 Eve Door & Window, which is a door/window sensor; the $80 Eve Room, which tells you the temperature, humidity, and air quality of any space; and the $50 Eve Weather, which does largely the same thing outdoors (with the exception of barometric readings replacing the air-quality function). Missing from Elgato’s connected-home collection: A motion sensor (the company does offer a smart LED light bulb, which is not part of this review). First a little on HomeKit, Apple’s connected-home technology. HomeKit devices can be controlled by iOS apps connecting directly with them via Bluetooth and/or Wi-Fi if you’re nearby, or your iCloud account when you’re out and about. Remote access should “just work” once you’ve entered the device code into you iCloud keychain. More on that in a bit. Elgato’s products use Bluetooth, probably because it’s far less power-hungry than Wi-Fi. The only issues there are that it limits the range of communications to about 25 feet and requires a bridge to reach the Internet. Via Bluetooth, when I was within the range of the devices, everything was hunky-dory. 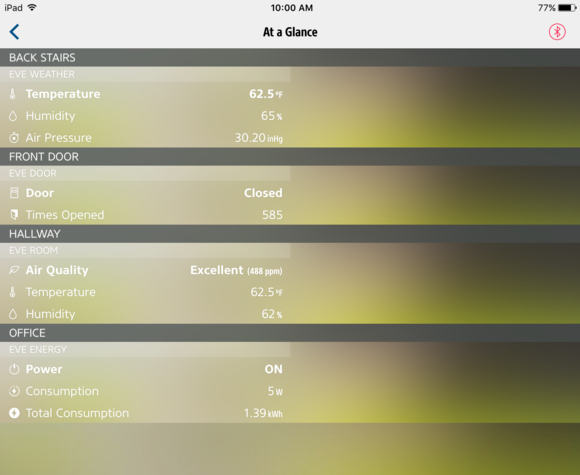 The nicely rendered Elgato app gathered all the pertinent information, and I was pleased to note that the air quality inside my house was considerably better than I had thought it was. Elgato thoughtfully loaned me an Apple TV to serve as a Bluetooth hub and to relay the device readings to iCloud. This is where I ran into problems. The Eve iOS app having just updated via iCloud. Notice that Bluetooth is off. For me, “just work” meant several days of sign-ons, sign-offs, resets, reboots, iCloud keychain enables/disables, reinstalls, and so on before I got remote access to function correctly. What appeared to fix things was signing off one of the iPads from iCloud. On the other hand, there was another Apple TV nearby. I never did learn the exact cause, because Apple veils connection and status information so that HomeKit seems “magical” and “transparent.” It also makes troubleshooting difficult in the extreme. Apple TV doesn’t show you what’s connected to it, and there’s zero info about HomeKit communications on the iCloud website. In the end, it all worked, even if I don’t know why it didn’t to begin with. Even when everything is working, you must still have all the Eve devices within 25 feet of the Apple TV, which could be tough depending on the size of your abode and the location of your TV. The Apple TV can’t be allowed to sleep if you want it to relay things to iCloud. There are third-party repeaters in the works, and to me, HomeKit won’t be a universally viable connected-home solution until they arrive. The Eve Door & Window sensor, which tells you whether a door or window is open or closed, is a two-piece device with one half residing on the door or window frame and the other on the door/window itself, I thought I might have problems mounting these on my rather ornate woodwork, but I didn't. The Eve Door & Window lets you know the status of your egresses. In fact, it was easy and the two parts aligned without my having to use the provided spacers. One thing I didn’t mention is that it tracks the number of times the ingress/egress has been accessed. I guess that might let you know that you need to get outside more. Or stay at home more. Elgato says the Door & Window will run for approximately a year on its single half-length AA battery. 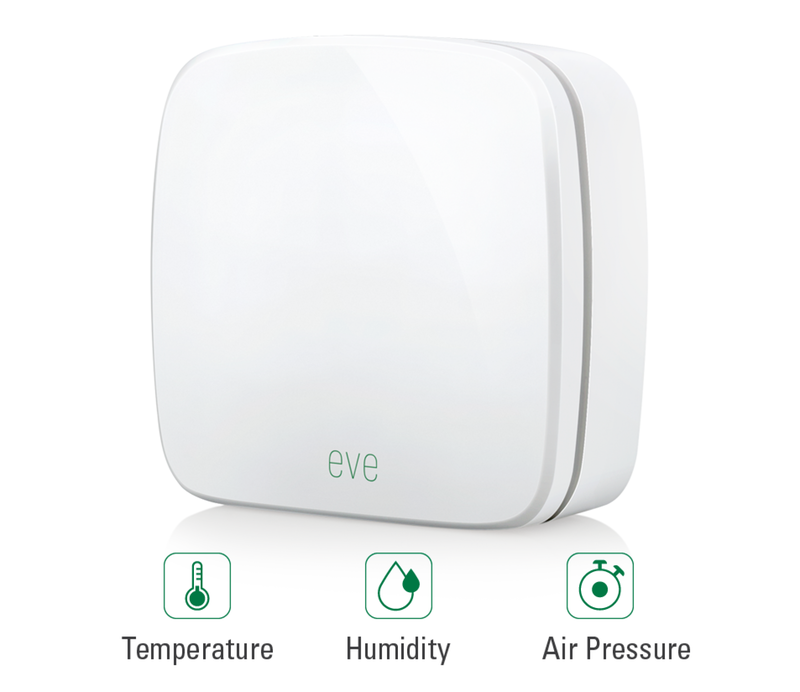 The Eve Room is an indoor environmental sensor. The Eve Energy, a three-prong single-outlet power adapter functioned perfectly as well. But it serves only as an on/off switch (it cannot dim a light) and energy meter, and there currently is no scheduling mechanism, though I was told one is planned. 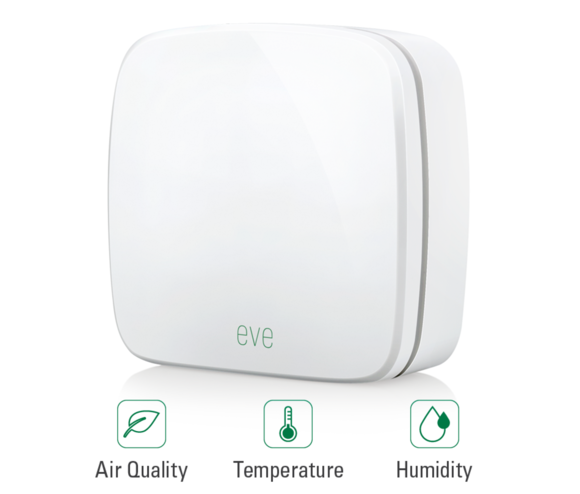 The Eve Energy doesn’t require a battery because it plugs into an AC outlet. The Eve app can break down information along a graph. Other than that, it basically shows you what the sensors are reading and lets you turn the Eve Power on and off. I didn’t really think I’d use the Eve products much, but they were surprisingly handy. I could tell if my roommate had walked the dogs with the Eve Door, whether it was raining or likely to with the Eve Weather, and I already mentioned accumulating evidence of second-hand smoke with the Room. Once it was working, the Eve system proved useful, but not life-changing. There are software features yet to come, but I’m giving all four Elegato products my seal of approval as is. That said, the actual ratings on the product pages reflect their current state of usefulness. This wireless on/off switch can report your energy consumption, but it won't dim a connected light and it can't do anything according a schedule. If you want to know what the weather is like or about to be like, without sticking your head outside your abode, this elegant barometer/thermometer/hygrometer combo will let you find out via your iOS device. But it will have to be within 25-feet, or 25-feet of and Apple TV until third-party repeaters show up. 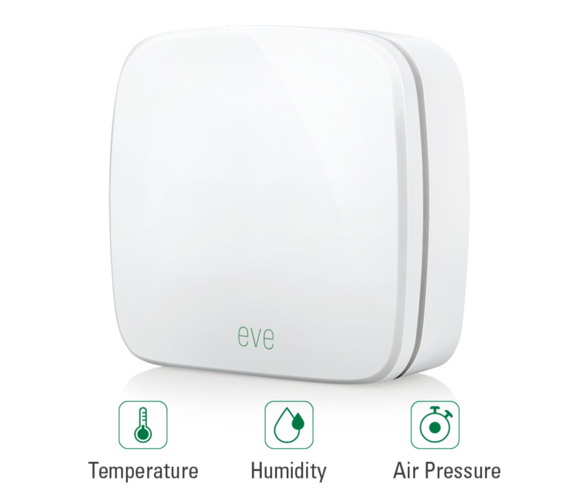 Simple, elegant and unobtrusive, the Eve Room is top-notch HomeKit indoor environmental sensor. But it's a lot more expensive than the thermometer and barometer it replaces and burns through three AA batteries every three months. For simple unobtrusive design, you can't beat this door and window sensor.